mr small just wants a job. why wont anyone give him a job?? is it because he is so small?? he tried to get a job and he wound up covered in mustard. then he tried to get a job and ended up drowning in candy balls. then he tried to get a job but just got snatched up by boxes. and then there were eggs... someone give mr small a job already, it is becoming too hard for him. Any Old Job Will Do10 December 2017 - Adelaide	Another Mr Men book about somebody seemingly unemployable getting himself a job. Actually that seems to be one of the themes that permeates the world of Mr Men, being able to find a place in the world where one can actually make a difference, or even do something beneficial. In a way a job does give somebody a sense of purpose beyond a simple paycheck to take home every fortnight. Mind you, some people simply do not see past the money aspect of a job, and unfortunately that actually does taint what happens to be quite a number of honourable professions, not to mention that a lot of these people know the right things to say to the right people. Well, I am currently sitting in a coffee shop on my way home, that is by plane, and I have managed to read all of the Mr Men books that I brought with me (though there are still quite a number sitting on my shelf at home, along side quite a number of other books that I want to add to my Goodreads read list). In a way it is back to work tomorrow, which sort of goes against some of the things that I have written above, but I guess that is the thing about work. When one gets their first job (or even a new job), one tends to be excited, but after about six months all of a sudden life sets in, and it starts becoming a bit of a drag – and then you wake up and suddenly you are having a mid-life crisis. Anyway, back to Mr Small, because the thing that stands out with him is that he is willing to give the various jobs suggested to him a go, right up until he realises that he simply cannot do them. That is the thing with many of the people in our generation – we are entitled, and we believe we are entitled to well paying respectable jobs. This did not seem to be the attitude with Mr Small because he would give anything a go. This is an attitude that should be admired, and if you are not able to do a job then it is okay for you to look for something more within your skill set. The problem is that sometimes that simply is not possible. The question is whether one should actually quit to look for another job. Well, that is quite a risk, though I have seen that happen often enough. I guess it depends on the job, on the employer, on the culture of the workplace, and also on your ability to be able to get another job. Some people just seem to have this gift at excelling at interviews, and some people will literally be willing to do anything (within reason of course). There are even people that can't work in the real world, but are willing to work just to have something to keep them busy every day. In the end, the moral of this story is to be like Mr Small. Don't be a job snob and sit on the couch playing Playstation or watching Netflix while waiting for the perfect job to come along. Go out and get a job, and give it ago. Don't make excuses as to why you can't, because in the end those excuses are only going to affect you. Even if you can't do the job at least give it ago – you don't have to commit yourself for the rest of your life. As is the case with Mr Men, they went from job to job to job until they found one where they managed to fit, and sometimes that might take years – just don't give up. Who wouldn't want to live at the bottom of a garden under a daisy?! This Mr Men book has one of the best side characters out of the series so far - Walter the talking worm! A tale in a Dickensian mould this time. Mr Small has to find work to survive, and ends up in a series of dead end, menial jobs. He seems exploited because of his size, and due to his small stature struggles to get along.With only his close friend, Mr Robinson, for support he keeps working, looking for the right opportunity.Then, just like Dickens, an unlikely benefactor appears from nowhere and provides the solution to all his problems. I remember this as being my second favourite of all the Mr Men books. We had a few at home, but my oldest brother announced every now and then that they were all his and wouldn't let us read them. At 13 or so I don't think he was reading them himself so he didn't notice when I got hold of them again. I did not like this book because I do not like being small. I also did not like this book because Mr. Small was very small. I learned that there IS a job out there, just waiting for me. Think I’m right in stating that as a boy I had all the pre-1990 Mr Men books with the possible exception of “Mr Snow”. Looking at all the covers apart from the latter jogged my memory.Sadly I remember little about the stories now, despite reading them numerous times during my boyhood, plus watching the Mr Men cartoons more than once.Reckon the last time I would’ve read these was 1983, though may have returned to them as late as 1985. Although I’ve forgotten almost everything about this title and all the others I feel that owing to the amount of times I read each publication that they all deserve to be rated five stars.I’m grateful to Roger Hargreaves for brightening up my childhood with both his Mr Men and the Timbuctoo series of books. My favorite of the three Mr. Men books that I read on new year's day is Mr. Small because it brings together world of the Mr. Men and the human world. 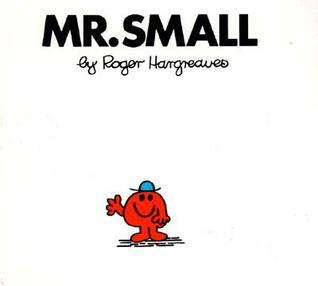 Mr. Small is probably the smallest of the Mr. Men and his size provides a unique series of challenges. Ultimately though Mr. Small's biggest problem is boredom. He wants something to do in his life and he decides the best way to do that is by getting a job.It is through the job search the the two worlds collide. Mr. Small goes to work for a variety of human employers. Over and over again Mr. Small finds himself too small to perform physical labor. At last though the perfect job lands in his lap. What is it? Ask Roger. Dude & I read this last night and I enjoyed it. Mr Small wants a job but he's tiny and finds that most things he's sent along to try out just don't work. But then, in a wonderful meta-fictional touch, he gets introduced to a writer of children's books.I think I enjoyed it more than Dude did, as he kept pointing out the repeats of "Mr Small" and the lack of punctuation! Students (especially little ones - ones who have been little throughout their early grade school years) will love this book and make a personal connection with M. Petit (the French version) who needs to find work and self-affirmation. Cool little book for kids. I read this to my nephew a few months ago but forgot to note that as a 'read'. It was short and sweet and my nephew loved it (as well as identifying all the other Mr Men on the back cover afterwards)! This looks like a 3 star book! This book was published 10 days before my birthday!! I womder what type of problem Mr Small will have! Probably my favourite Mr Men of all time! Life's not much fun when you're small. Mr. Small manages to find a way to improve his lot. Aryana loved the ending which was essentially breaking the fourth wall! “Mr Small” - Poor Mr Small. Isn't there any place that he can find a job. With the help of Mr Robinson he is able to contribute to his community. Tate's favorite of all the Mr. Men books! Self-referential. Clever. My 4-year-old got it, too, so I think it means the cleverness is also cleverly done. cute story with adorable characters. Roger Hargreaves - Charles Roger Hargreaves (9 May 1935 – 11 September 1988) was an English author and illustrator of children's books, notably the Mr. Men and Little Miss series, intended for very young readers. He is Britain's third best-selling author, having sold more than 100 million books.Hargreaves was born in a private hospital at 201 Bath Road, Cleckheaton, West Yorkshire, England, to Alfred Reginald and Ethel Mary Hargreaves, and grew up in High Lees, 703 Halifax Road, also in Cleckheaton, outside of which there now is a commemorative plaque. He spent a year working in his father's laundry and dry-cleaning business before starting out in advertising. But his original ambition was to be a cartoonist; and, in 1971, while he was working as the creative director at a London firm, he wrote the first Mr. Men book, Mr. Tickle. He initially had difficulty finding a publisher; but, once he did, the books became an instant success, selling over one million copies within three years and spawning a BBC animated television series, narrated and voiced by Arthur Lowe.By 1976, Hargreaves had quit his day job. In 1981, the Little Miss series of books began to appear. It, too, was made into a television series in 1983, which was narrated by John Alderton, who, with Pauline Collins, voiced the Men and Misses, respectively. Although Hargreaves wrote many other children's stories, including the Timbuctoo series of twenty-five books, John Mouse, and the Roundy and Squary books, he is best known for his 46 Mr. Men books and 33 Little Miss books.With his wife, Christine, Hargreaves had four children: Adam, Giles, and twins Sophie and Amelia. The first of the Mr. Men characters is reported to have been created when Adam asked his father what a tickle looked like: Hargreaves drew a figure with a round orange body and long, rubbery arms, which became Mr. Tickle.After Hargreaves died of a sudden stroke in 1988, Adam continued writing and drawing the Mr. Men and Little Miss characters in new stories. However, in April 2004, Christine sold the rights to the Mr. Men characters to the UK entertainment group Chorion, for £28 million.